Description: NS 13T eases down the 1 runner while a CP poewr set sits on the 2 runner, and the SW1500s work the yard. Description: NS 9431 blasts eastbound with 20E in tow heading through Vallley Forge Park. Description: About to enter the Pine Yard lead track off the NS ex-NYC Chicago Line light with UP C41-8W 9098 at Pine Junction. Description: #19G resumes its westward trek after meeting 24z and 212 at CP-67. Description: Eastbound 24V creeps to the home signal as 21M passes westbound.. Description: WB Train 19G, 0843 hours. Description: [NS Piedmont Division - Charlotte District - Buck Steam Plant lead] Empty coal trai n77K sits on the Buck Steam Station lead waiting on a fresh crew to take it back to the Pocahontas coal fields. Description: NS 9431 waits on the Buck Lead, Salisbury with PL97, later to be 77K, note the dents on the RR crossing sign where people have taken target practice at it. Description: NS 154 leans into Ebenezer curve with green signal ahead and a return to single track. Description: 19G slowly moves through Bethlehem at 8:32AM and passes I4V, which was just starting up when this shot was taken. Description: I would see this same train later in the day in Emmaus, after it made its pickups and setouts in Allentown. Description: 19G passes Emmaus at 12:18PM. 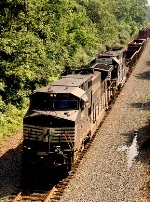 Description: 4th unit on NS 236 around milepost 7 on the CNO&TP climbing Erlanger Hill. Description: Westbound on track two with a pair of widecabs as the OCS power works its way down the track to the Museum. Description: NS D9-40CW 9431 and SD70M-2 2763 power a westbound freight.